For traditional Communications Service Providers (CSPs), the barriers to applying automation are coming down faster than ever before due to the use of new technologies such as analytics and machine learning. So what is different, and why is now the time to act? By determining the right combination of these three factors, CSPs are able to maximize the ROI impact associated with the automation platform and related project delivery costs. A good example of a target service that matches these factors are residential telecommunication services such as home broadband. There is low variance in the service as customers are limited in the number of available options (e.g. different speeds of service), however there is still a high volume due to the large population. In these cases, the fact that the revenue per service is likely lower than an enterprise service this is balanced out by the relatively high volume of services. 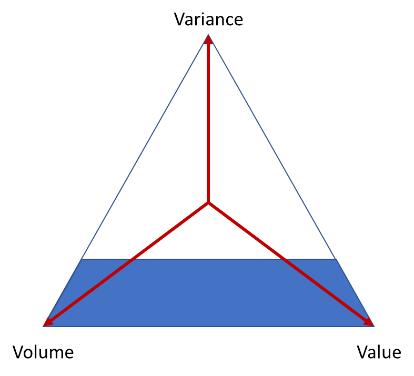 We can illustrate this relationship using a simple vector diagram of the three factors (see Figure 1). Using existing platforms and delivery approaches, a CSP would only target a small amount of the total possible list of activities, maybe < 30% as shown by the shaded area in the diagram. To meet the goal of dramatically increasing the level of automation being used, we need to address the cost barriers that have been seen in the past. A main factor driving the high expenditures associated with network automation is the IT configuration cost. Typical projects still use a human craft process to configure the IT platforms. To automate an activity, we capture the manual steps taken by the best and brightest of our IT and network teams, and then drive that process into an IT system. Ciena’s approach to Intelligent Automation looks to address configuration-related cost barriers in two ways. The first is platform costs. By providing a model and microservices-based platform, we reduce the time and effort required to capture the steps required to automate a process. The second is removing as much of the manual craft from the process as possible by applying analytics and machine learning. By leveraging these technologies to identify where automation should be applied, as well as what combination of existing automation capabilities can be reused, we can guide the IT team, and further reduce the manual craft nature of the process, significantly reducing the cost barrier to automation adoption. Taking this approach, we can increase the potential target area of automation closer to 80% of the activities performed by a CSP today. 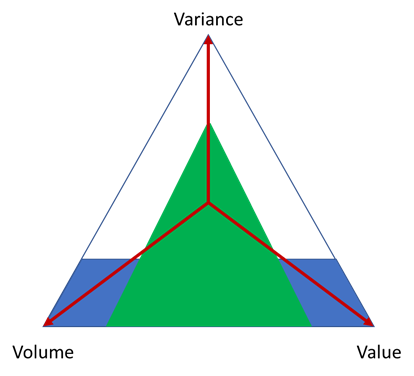 As can be seen in the diagram below (see Figure 2), this allows us to deal with an increase in variance of tasks, and the reduction of volume and value to achieve a greater coverage. The traditional barriers to automation are being removed thanks to the advent of intelligent automation platforms that take advantage of recent technology advances like microservices, analytics, and machine learning. Using the three Vs of network automation – Volume, Variance, and Value – is one way to set goals for the level of tasks you should automate, but there are many others. The important point is that network automation is becoming increasingly feasible from a cost perspective, and the time is now to examine where it makes the most sense to apply it in your network and operations environment. I also encourage you to read more about this topic by downloading Ciena’s related white paper Creating Intelligent Hybrid Operations - How Intelligent Automation addresses the challenges posed by SDN and virtualization.